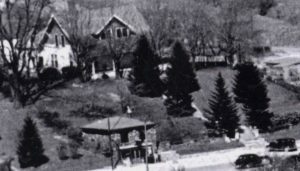 Detail crop from 1939 image of Boone, showing Linney Law Office with Linney House on the hill above. Image courtesy of the Cy Crumley Scrapbook. The Frank A. Linney House, on the hill above West King Street, and the former Linney Law Office, below the house site, sit on land that was originally part of the 50 acres donated by Ransom Hayes and Jordan Councill, Jr., for the establishment of the first Watauga County Courthouse, probably in 1850, a year after the county was established. This courthouse sat at the top of the hill, near the house site, and fronted on Queen Street. It burned on March 29, 1873, prompting the construction of a second courthouse on the northeast corner of West King and Water Streets, about one block to the west of the former Linney Law Office. The well currently located on the Frank A. Linney House property is believed to be the original courthouse well, dating to the property’s use by the county. Following the courthouse fire, the county commissioners sold the former courthouse property as two distinct parcels to Thomas J. Coffey and W. C. Coffey in 1877. By February 1891, the Coffeys had reached an agreement with Richard Lenoir Councill for the sale of the vast majority of the east parcel of the old courthouse land. R. L. Councill built the original version of the Frank A. Linney House in 1894. Frank Linney bought that house in 1902, then greatly modified the house in 1915-16, expanding it substantially. That house was declared a Local Historic Landmark in 2017. The Frank Linney Law Office, located directly on West King Street at grade, was part of the building boom that took place in Boone between 1922 and 1925. To understand that building, though, we need to understand the man. Frank A. Linney (June 29, 1874-June 29, 1928) was a prominent attorney, politician, and community leader in Boone from 1901 until 1928. A native of Taylorsville, in Alexander County, North Carolina, Linney first moved to Boone in 1901, where he established a thriving law practice. Linney was the son of Dorens Stevenson Linney and Romulus Z. Linney, a powerful North Carolina politician during the late nineteenth century who purchased Tater Hill in Watauga County as a summer home, thus introducing Frank A. Linney to the area. Linney completed his undergraduate education at Trinity College (later Duke University), then studied law in Morganton, North Carolina, with Judge A. C. Avery, the former dean of Trinity College Law School. He was licensed to practice law in 1898, and he opened a real estate agency in Boone in 1901, with Linney acting as attorney for the firm. By January 1902, Linney was also advertising generally as an attorney at law, with an office located in the Bryan Hotel, which was located across the street. In private life, Linney was married to Mary Hessie Matheson in January 1900, by whom he had five children. Frank A. Linney. Image courtesy of the Historic Boone Collection, Digital Watauga. His life-long commitment and participation in North Carolina politics and the practice of law made him both a well-known and well-respected figure in Boone and North Carolina. Linney served as the Eighth Judicial District Solicitor in North Carolina from 1906 to 1914, then was appointed by President Warren G. Harding as the US District Attorney for the Western District of North Carolina in 1921, a position he resigned in December 1927 as part of an effort to secure a federal judgeship. When this effort failed, Linney elected to retire from political life to private practice in January 1928. 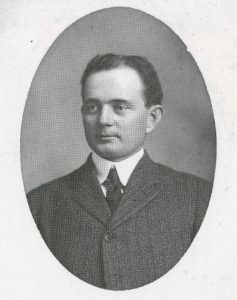 Linney was also the Republican candidate for North Carolina governor in 1916 (losing to Thomas Walter Bickett) and served as chairman of the North Carolina Republican Executive Committee from 1913 to 1921. Linney was also active in numerous civic endeavors. He was a trustee of multiple universities, including Appalachian State Normal School (now Appalachian State University), as well as a Royal Arch Mason. Aside from this building and his home up the hill, one of his other great architectural contributions to the Town of Boone was the Frank A. Linney Block, the large block of buildings across the street, running from Art Mart down to the jewelry store. He was also one of the original investors in the construction of the Daniel Boone Hotel. After his death in 1928, which occurred in his house, he was remembered for his commitment to the region. An article in the Watauga Democrat eulogized him with the words: “His interest in the advancement of his town and county had not waned and every move for their improvement was given his loyal support.” Frank Linney’s commitment to Boone and Watauga County lasted for much of his adult life, and he helped shape the region during a time of dramatic change and growth. Linney Law Office, Early 1951. Image courtesy of Sarah Lynn Spencer and the Palmer Blair Collection, Digital Watauga. Linney’s law office building is a square, two-story, hip-roofed, fieldstone building with hidden mortar that was completed in December 1923. Linney began work on “a more stately and modern building” at the southwest corner of his property to replace the law office he had been using in May 1923 (Watauga Democrat, May 17, 1923). A local news item described the building as “one of the most unique and splendidly constructed buildings yet erected in our growing town. The walls are of solid stone masonry—surface rock—while the floors of the first story are of concrete and used as a private garage. The offices on the second floor are plastered throughout, save the gum ceiling. Truly the ‘Little Rock House’ is a thing of beauty.” The second story features two five-over-one, single-hung sash windows with fixed, Craftsman style upper sashes. An unusual fieldstone pilaster directly above the first floor entrance separates these windows, while broader pilasters frame the southwest and southeast corners. The north elevation, which is not visible from the street, is also of native stacked stone and repeats the corner pilaster treatment. It also features two additional Craftsman-style windows at the second floor level that are like those found on the south elevation. 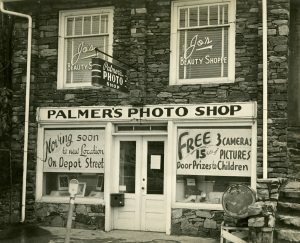 Following Linney’s death in 1928, the building held numerous occupants throughout the twentieth century and up to the present day, with the first floor of the building being converted to a shop space sometime before 1950, when Palmer Blair’s photo studio occupied the first floor for several years. Other than a presumed modification of the south elevation of the first floor from a garage bay to the storefront configuration seen at Palmer’s Photo Shop sometime before 1950, and a change from the French door entrance seen circa 1950 to the single door entrance seen today, the building is otherwise nearly unchanged since its construction in 1923. The Frank A. Linney Law Office was designated as a Local Historic Landmark by the Town of Boone in 2017. Portions of this text are taken from the Local Landmark Designation Report authored by Eric Plaag and Paul Fuller in 2017, as well as the forthcoming Downtown Boone Historic Resources Survey Report written by Eric Plaag.